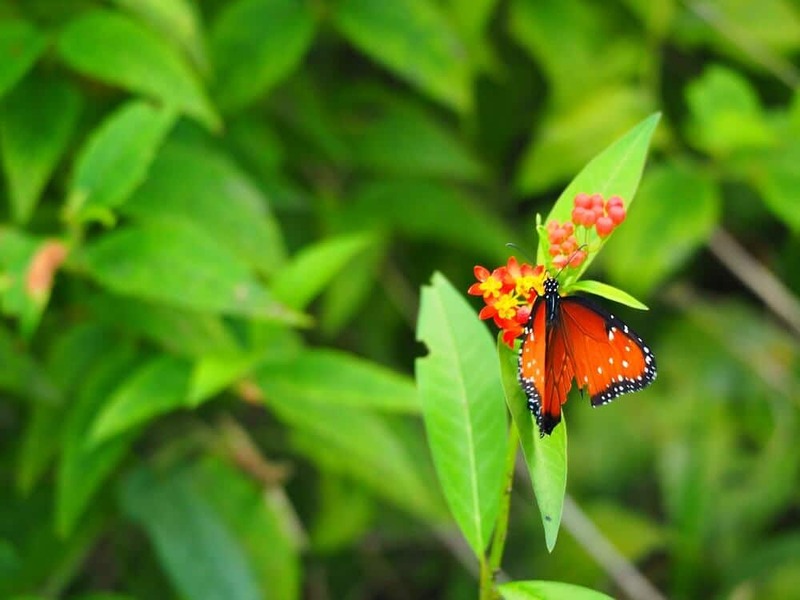 Crooked Tree Wildlife Sanctuary is the place to see Belize wildlife. Want to see a crocodile? 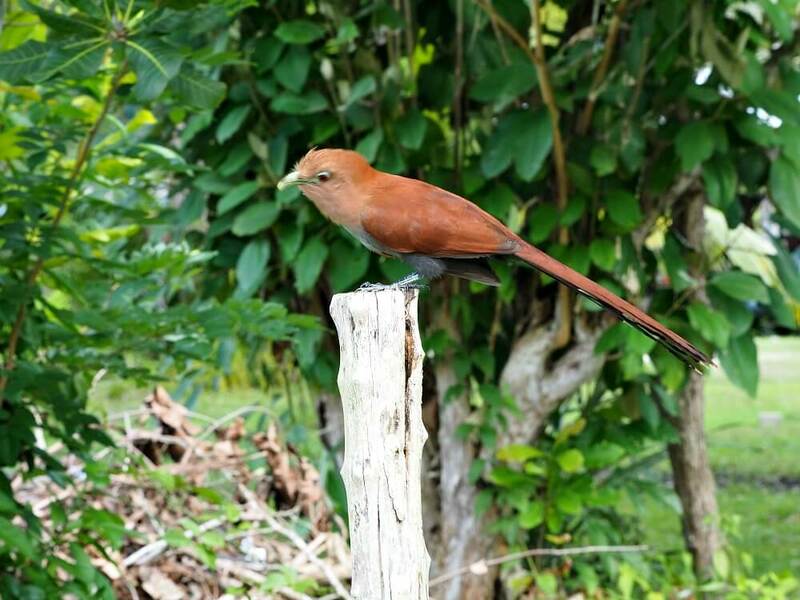 You’ll find them all here at this Belize wildlife sanctuary. But it’s the birds of Belize that the area is famous for and it’s why we’d come to Crooked Tree. We wanted to see the birds of Central America. What Is Crooked Tree Wildlife Sanctuary? 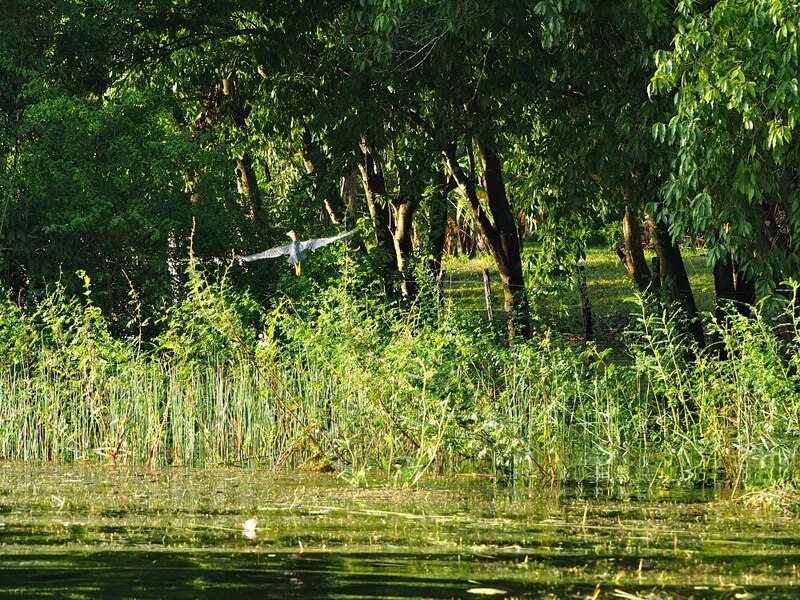 Crooked Tree Wildlife Sanctuary Belize is a natural wonderland of creeks, lagoons, marshlands, savannahs and logwood thickets. 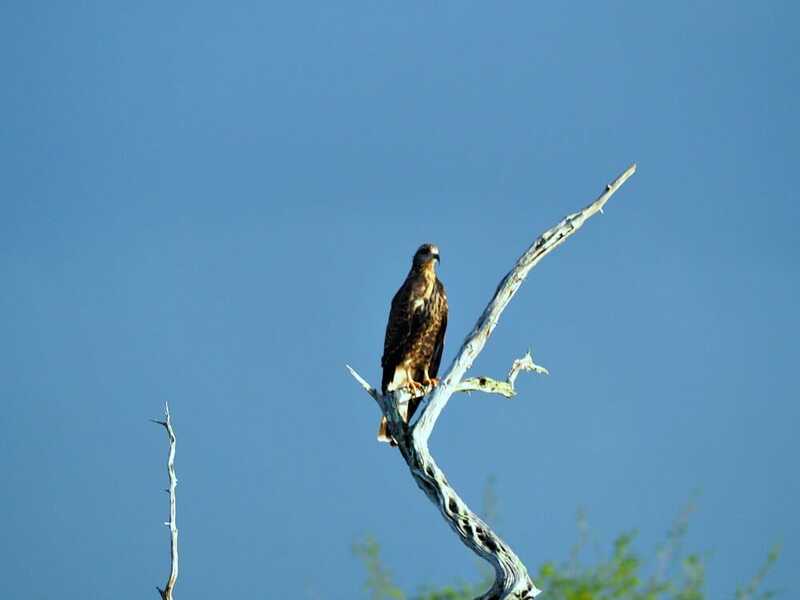 It’s a protected preserve that provides a safe habitat for the incredible wildlife that calls the crooked tree home. There are black howler monkeys, iguanas, crocodiles, turtles and pretty butterflies. 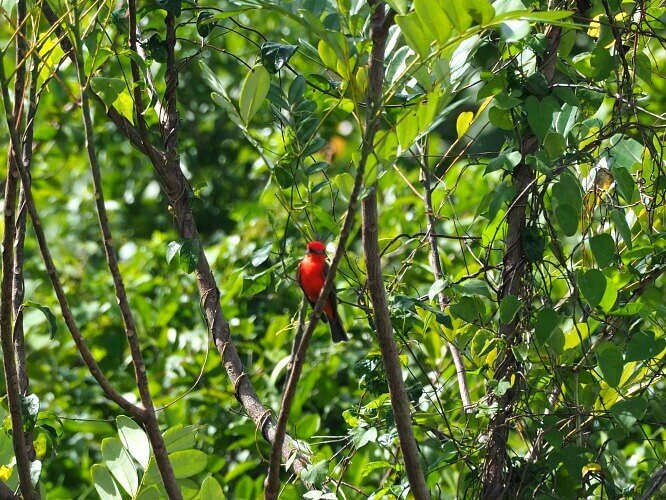 And for those who’ve come to do some birding in Belize, the variety of birds is amazing. 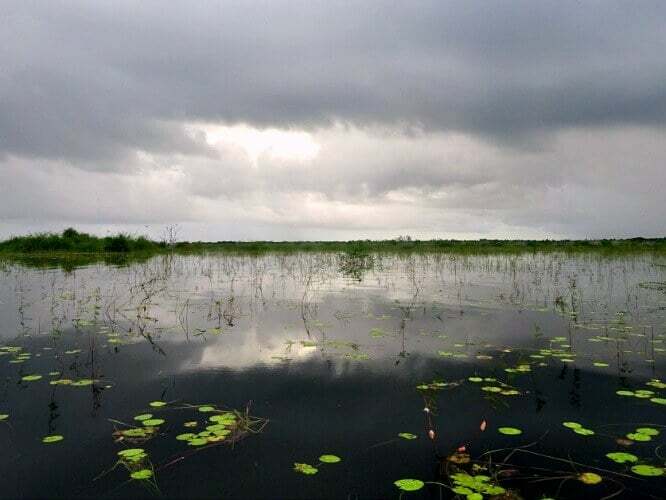 The sanctuary is managed by the Belize Audubon Society and is recognized as a Wetland of International Importance under the Ramsar Convention on Wetlands. But, it’s most famous for the huge Jabiru bird. This large stork gained protected status in 1973 and their numbers have been slowly rising. Two pairs of Jabiru are known to nest in the sanctuary. They typically arrive in November to build their nesting platforms and raise their young. It had been a bit of an ordeal for us to get to Crooked Tree. Not that it’s difficult to get to, it’s just that our timing was off and we had to spend a couple of nights in Belize City. You can read about that story by clicking here. And then, once we arrived, we found ourselves surrounded by mud looking through a closed gate. There was a woman standing beside me who had stopped to give us a lift to Crooked Tree Lodge. She’d been on her way to see Ange, one of the owners. But when we arrived the place was deserted. Except for a barking dog. “I don’t know if it bites,” she said. After honking the horn a couple of times, she asked us what we were going to do. “I guess we’ll just wait,” Andrew told her. Looking dubious she said to let Ange know she had dropped by and drove away. We were lucky she’d given us a lift. The road was a quagmire and we would have been up to our knees in mud. This place had seen some rain. Fortunately, the lodge itself was in much better condition and we were able to walk around the grounds. It turned out there were two dogs. And neither of them bite. Phew! There wasn’t a soul around. And visions of every horror movie I’d ever seen popped into my head. Any minute I expected a slimy green monster to come crawling out of the lagoon! It was entirely our fault we were in this situation. I’d emailed asking for a booking a couple of days before and hadn’t received a reply. Most people would take that as a no. But not us, we thought we’d take a chance and turned up anyway. So, fingers crossed, we waited. 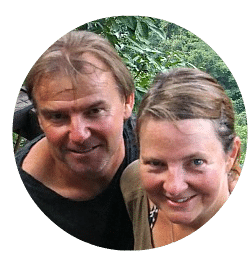 And after what seemed forever, the owners Mick and Ange arrived to find two grungy old backpackers sitting on their deck. But true to the laid back Belizian way they just took it in their stride and showed us to a delightful little cabana with lagoon views. 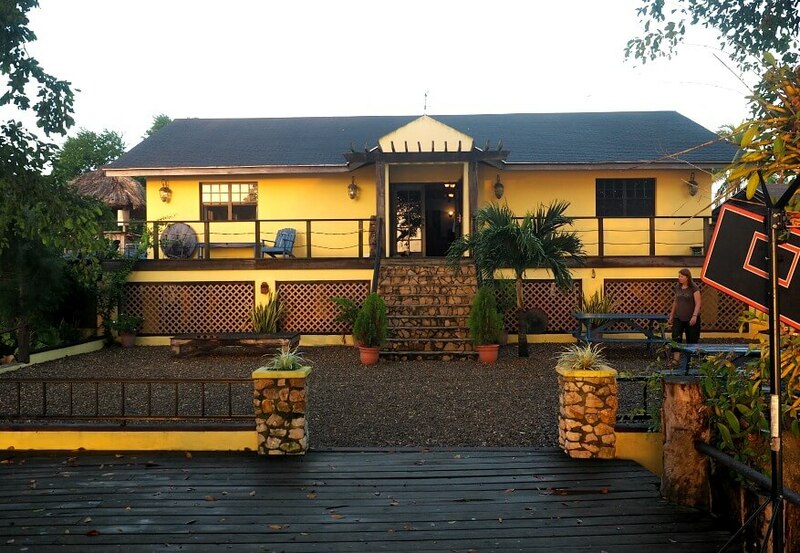 Crooked Tree Lodge Belize is a family run business known for its relaxed community atmosphere and delicious food. It sits right in the heart of the sanctuary and is surrounded by beautiful trees and ponds and of course the lagoon. The comfortably furnished main building has excellent wifi and is a great place to hang out. Coffee and tea are available all day. The tasty meals are reasonably priced and served at a communal table. It’s a great way to get to know other guests. We met a wonderful couple, Tom and Cheryl who had lived in Belize many years ago. As we were all checking out on the same day they offered to drive us part of the way to San Ignacio. They even stopped so we could visit the Belize Zoo along the way. If you are thinking of hiring car in Belize click here to find out everything you need to know. You know how they say you really get to know someone when you travel with them? Well, I was stunned to learn how much Andrew loves birds. He spent most of his time walking around the lodge with his head tilted back looking up at the sky. But the birds weren’t just in the sky. They were hiding in the trees and bushes, bobbing up and down on the water, and prancing in the shallows. The best time to visit the sanctuary is from February to May when the waterways are at their lowest. Birds are at their greatest abundance in April. We visited in mid-December and water levels were high due to unusually heavy rains. It didn’t affect our time there though. And it was stunningly atmospheric. A stormy day on Crooked Tree Lagoon. 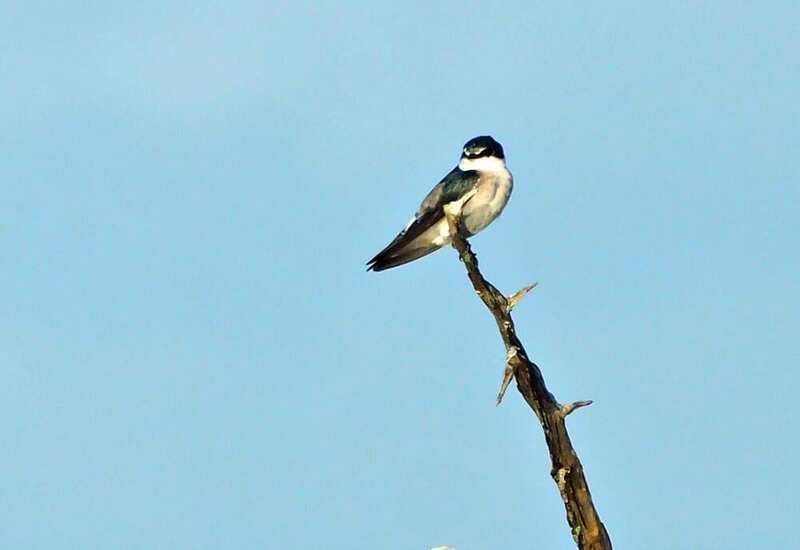 The best way to see birds is by getting out on the water on a Crooked Tree Wildlife Sanctuary Tour. 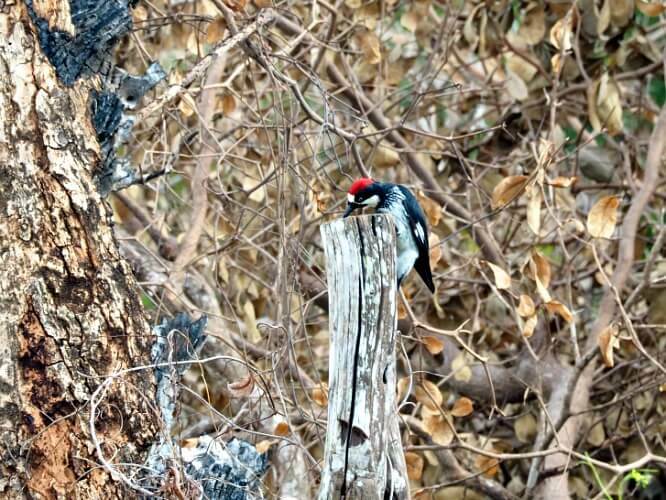 It’s a wonderful experience for birders of all skill levels and Andrew booked his tour through the lodge. I decided to stay back to make use of the great wifi and catch up on some work. It was a 6.30 a.m. start and the sky was just beginning to lighten as I kissed Andrew goodbye. Little did I know the spectacular morning he was about to have. There were two other couples on the tour. Our new friends Tom and Cheryl and their two friends who were visiting from Orange Walk. Their guide Reuben has been studying birds for nine years and was a wealth of information. He’d brought a birding book along and showed Andrew what features to look for when identifying birds. 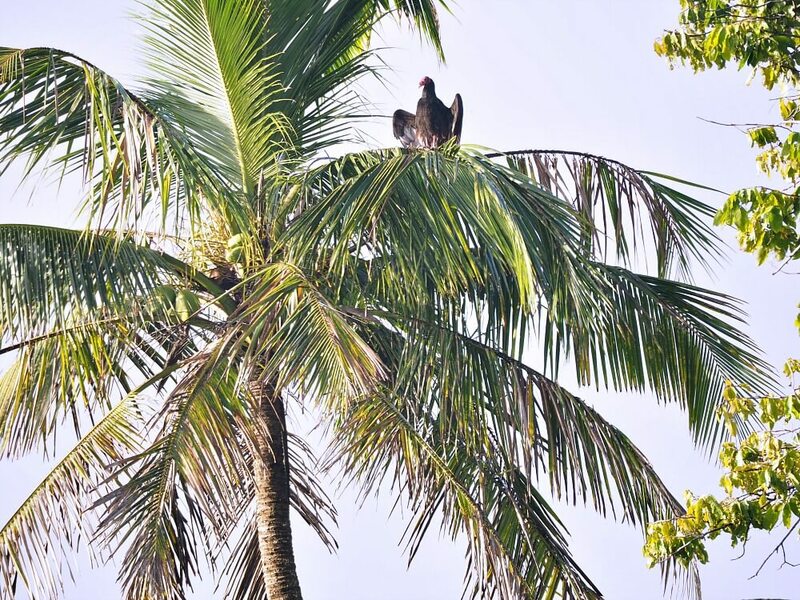 But birds weren’t the only thing on the agenda and Reuben said to keep an eye out for crocodiles, turtles, and iguanas. And sure enough, they spotted a crocodile basking on the shore and this crazy looking iguana. They didn’t see any turtles though. The best thing about visiting a place like Crooked Tree Wildlife Sanctuary is that all the visitors are of a like mind. So everyone was able to enjoy the tranquillity and concentrate on the wildlife. Like the vultures and eagles that flew overhead and the kingfishers that dove into the lagoon. Spectacled Owl – Andrew was so thrilled to have seen this owl. Once the tour was over everybody returned to the lodge for a hearty breakfast. And it was obvious from the excited chatter that a wonderful morning was had by all. Perhaps I should have gone? The tour cost $US30 and went for 3 hours. For more information contact Crooked Tree Lodge. You don’t have to do a boat tour to see wildlife though. Early morning and late afternoon walking tours are also available. Or you can just go for a wander on your own. The grounds are impeccably maintained and lots of creatures call it home. Crooked Tree Village Belize is famous for the cashews that grow in abundance in the area. And every May the village celebrates with an annual Cashew Festival where a wide array of cashew products are available to try. Ever had stewed cashew fruit? But I’d sure like to try some! And like all good festivals, there’s music and dancing and lots and lots of food. 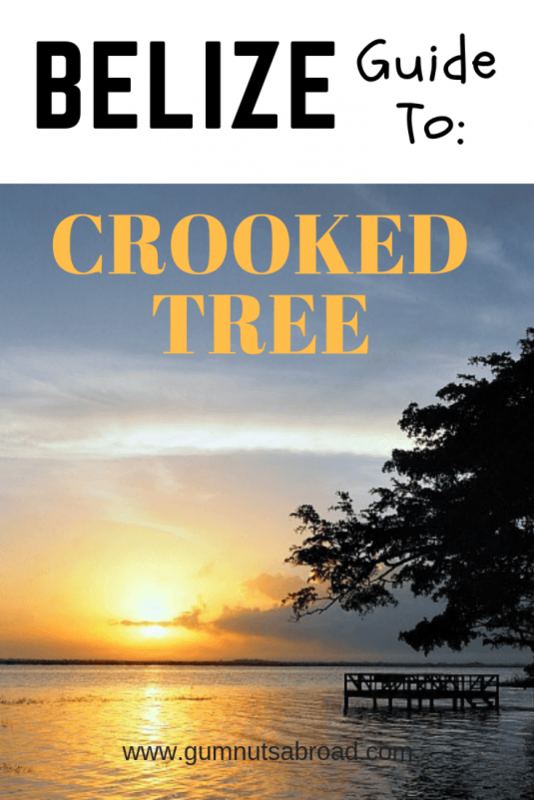 Crooked Tree Belize is around 3 kilometres off the Phillip Goldson Highway. 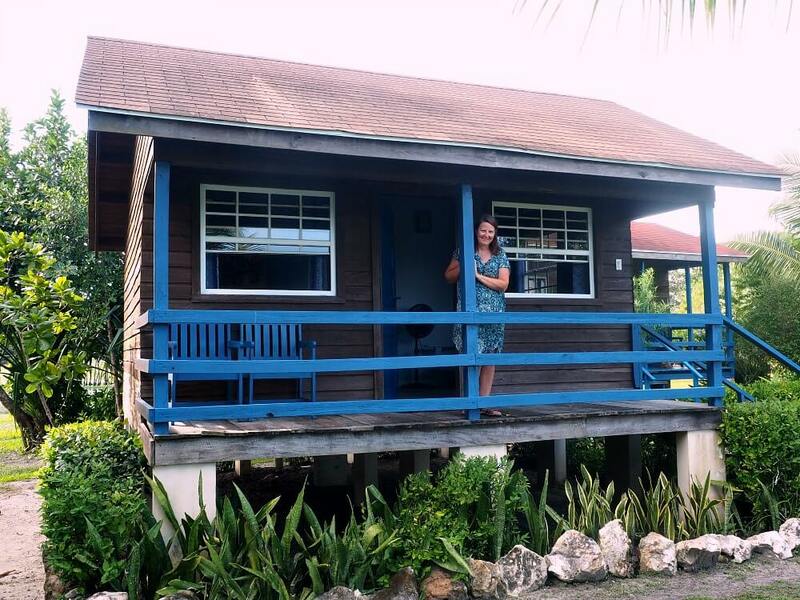 The village is halfway between Orange Walk and Belize City – about 53 kilometres either way. If you’re coming directly from the airport it’s about 40 minutes by taxi. The bus from Belize City cost us $US3 each. You can buy your ticket on the bus. It leaves once a day, Monday – Saturday, at 9 a.m from outside Mike’s Club. Please note: There is no bus on a Sunday. 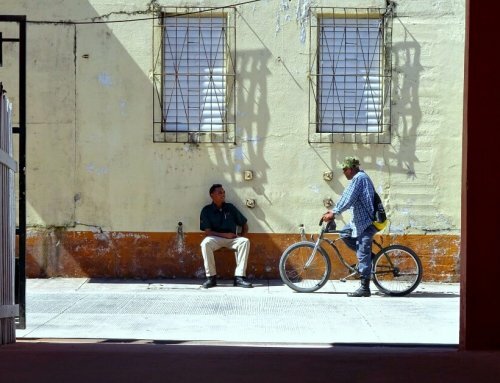 We arrived in Belize City on a Saturday afternoon from Caye Caulker and had to spend a couple of nights in the city. If you choose to stay at Crooked Tree Lodge either Mick or Ange will pick you up at the bus stop. Just make sure you book well in advance! Crooked Tree Wildlife Sanctuary is open every day from 8 a.m-4.30 p.m. Check out the visitor centre and its cool displays. Consider hiring a car from Belize City. It makes getting around so much easier. Bring all your essentials as the shop has limited goods. Insect repellant and sunscreen are essential! If you’re going out on the water take a dry bag for your camera gear. An umbrella is handy in the rainy or shoulder seasons. 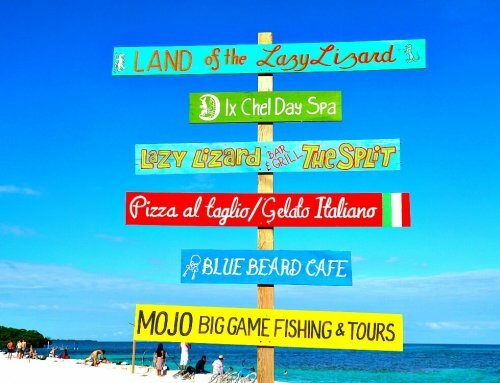 Many people skip Crooked Tree in favour of more popular destinations in Belize. 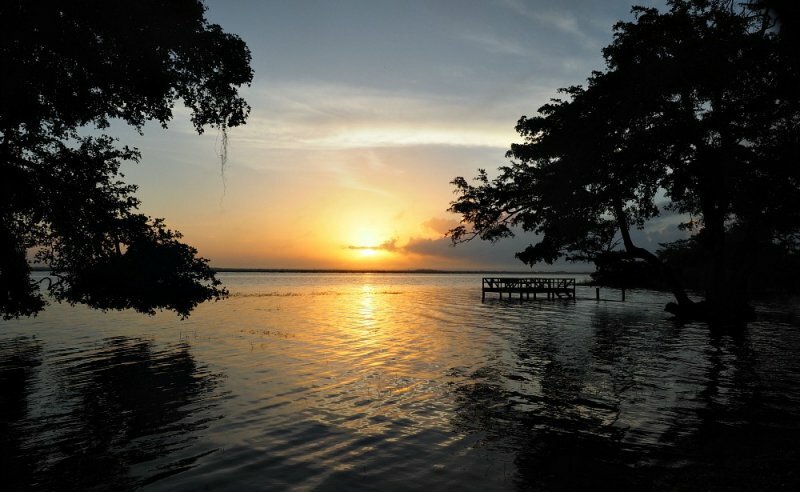 But, if you like nature, wildlife or birds, put it on your list of things to do in Belize. Are you a bird lover like Andrew? Let us know in the comments below, we’d love to hear from some fellow birders! We’d love to keep sharing the magic of travel with you. So feel free to subscribe to our email in the box below.